The Board of Management of St. Brigid’s N.S. has set out its policy in accordance with the provisions of the Education Act 1998 and the Education (Admissions to Schools) Act 2018 as commenced. The Board trusts that by so doing, parents will be assisted in relation to enrolment matters. Furthermore, the Principal teacher will be happy to clarify any matters arising. The Board of Management of the school, in accordance with school policy, makes decisions in relation to applications for enrolment. St. Brigid’s N.S. is a primary, co-educational, Roman Catholic school serving the parish of Our Lady Mother of the Church, Castleknock. The school is under the patronage of the Catholic Archbishop of Dublin. The school has a total of 48 teachers which comprises 32 class teachers, 14 special education teachers an Administrative Principal and Administrative Deputy Principal. St. Brigid’s N.S. operates under the Rules for National Schools and the Department of Education and Skills (DES) guidelines. St. Brigid’s N.S. has a Catholic ethos, which aims to facilitate the holistic development of all its pupils to the best of their ability. The Board of Management, staff, parents and school community work in partnership, to develop moral, Christian values and to meet the needs of all its students. The Catholic Archbishop of Dublin, Dr. Diarmuid Martin is patron of St. Brigid’s N.S. The Board of Management reserves their right to promote and uphold a Catholic ethos under Section 7(3) of the Equal Status Actwhile recognising, respecting and welcoming the diversity of values, beliefs, traditions and ways of life in society. The school follows the curriculum guidelines issued by the Department of Education and Skills which may be amended from time to time in accordance with Section 9 and 30 of theEducation Act 1998. All children are expected to participate in all aspects of the curriculum. The school provides Religious Education for Catholic pupils in accordance with the doctrines, practices and traditions of the Roman Catholic Church. The School adheres to Circular 0009/2017 and any subsequent circulars concerning the standardisation of the school year. Parents are informed of school closures at the commencement of each school term. The Board of Management of St. Brigid’s N.S. has formally adopted and implemented Child Protection Procedures for Primary and Post Primary School, 2017 which is based on Children First: National Guidelines for the Protection and Welfare of Children 2017. Our Child Safeguarding Statement is available to be read in reception or on the school website and app. Pupils enrolled in St. Brigid’s N.S. are required to co-operate with and support the school Code of Behaviouras well as other policies. A copy of the school Code of Behaviour is available on the website, app or in Reception. Parents are responsible for ensuring that their child(ren) co-operate with the policies in an age appropriate manner. Parents who accept a place for their child in St. Brigid’s N.S. will be required to sign an undertaking on the school application form to support the implementation of school Code of Behaviour and other policies. The BOM reserves the right to determine the number of classes at each level and the maximum number of children in each class. Children of present staff members of the school. Places will be allocated to children in this category in order of date of birth, starting with the oldest pupils. Children who are resident outside the parish of Our Lady Mother of the Church, Castleknock on the date of enrolment. Places will be allocated in this group (in order of date of birth starting with the oldest children) if vacancies exist when Category 1 children have been accommodated. The Board will not consider an application for enrolment in a new Junior Infant class any child who is currently in a junior infant class in another primary school. B:Parents who wish to register an interest in enrolling their child in St. Brigid’s National School should add the child’s name and contact details to a New Entrants List on the school website and app. This list will be active up to the end of the first week in January. When the online form has been submitted parents/guardians will receive a reference number which they should note. Please remember this list does not infer any priority for enrolment purposes. If parents or guardians have any difficulty with the online form they are advised to give their details in person at the school office. It is parents’ responsibility to ensure that all details given are correct. C: In January of the year of enrolment, parents/guardians of children on this list, along with all other interested parents, are invited by letter to confirm that they wish to have their child enrolled in St. Brigid’s N.S. Two Utility Bills (Electricity, Water, Gas, Land-line Telephone and Internet)from the past three months as proof of present address. Mobile phone bills or bank statements cannot be accepted. Children must have reached the age of 4 years by the last day in September of that year for enrolment to Junior Infant classes. Proof of residency may be checked in order to determine eligibility for enrolment. Incorrect information submitted in relation to any aspects of the enrolment application invalidates the application. The BOM reserves the right to withdraw an offer of enrolment on the basis of false or misleading information provided. The completion of an application form or the placement of a child’s name on a waiting list does not confer a right to a place in the school. Places are allocated according to the enrolment criteria. D: Offers of places will be sent to parents by mid February. Places must be accepted not later than 14 days after the offer of a place has been notified – a place will be forfeited if a letter of acceptance is not received in this time frame. Parents have the right to appeal any enrolment decision to the board and this should be done in writing. Under Section 29 of the Education Act, 1998, any parent or guardian can appeal a school’s refusal to enroll his/her child. The Board of Management will monitor the implementation of all aspects of the Policy and amend the Policy as required. This enrolment policy was reviewed and updated by the Board of Management of St. Brigid’s N.S. in November 2018. St. Brigid’s N.S welcomes children with special needs. The school will not refuse a child on the basis of ethnicity, special education needs, disability, traveller status, refugee status, political beliefs, family or social circumstances, provided the necessary supports are in place in the school and subject to the criteria of the policy. In relation to applications for enrolment of children with special needs, the Board of Management may request a copy of the child’s medical and \or psychological report. Where such a report is not available, the Board of Management may request that the appropriate professional assess the child immediately. The purpose of the assessment report is to assist the school in establishing the educational and care needs of the child relevant to his/her special needs and to profile the support services required. St. Brigid’s N.S. is a Catholic school and the underlying ethos of the school is a Catholic ethos. A crucial element of the promotion of this ethos is the teaching of the religion in class. While we welcome children of all religions and none to our school, we cannot provide supervision outside the classroom for children who do not wish to participate in religion classes. 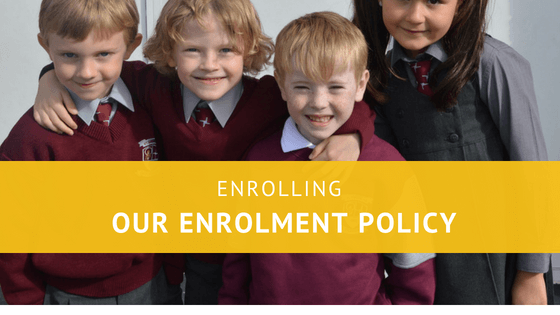 In line with our data protection policy, the enrolment form filled out by applicants is strictly confidential and used by the school for the child’s benefit. A Birth Certificate must be presented at this time.